Tobacco Induced Diseases recently published an article reviewing findings on tobacco-induced bacterial biofilms. But what are biofilms and how does tobacco affect them? Authors David Scott, Justin Hutcherson and Juhi Bagaitkar answered our questions in this blog. How does smoking increase the risk of bacterial growth? David A. Scott is a Professor of Oral Immunology and Infectious Diseases at the University of Louisville, KY, having obtained a BSc from Heriot-Watt University, Scotland and a PhD from McGill University, Quebec. Justin A. Hutcherson, Ph.D. and Juhi Bagaitkar, Ph.D. are post-doctoral fellows in Oral Immunology and Infectious Diseases at the University of Louisville and in Pediatrics at Washington University School of Medicine, MO, respectively. A biofilm is comprised of a large number of microbial communities adhered to each other or to a surface and embedded within a self-synthesized extracellular matrix or slime. Biofilms can be formed by a single species of bacteria but are more often complex, interacting and co-existing multispecies structures. Within the layers of a biofilm, an intricate network of pH, nutrient and oxygen gradients allow for specific niches suitable for the development of a diverse community. Bacteria are able to form biofilms on most surfaces including plastics, rocks and metals, as well as host surfaces, such as teeth, heart valves and mucosal layers (gut, respiratory tract, oral cavity and urogenital tracts). Once initial bacteria attach, other microbes adhere to these early colonizers facilitating the growth and maturation of the biofilm. There are a number of advantages conferred on biofilm dwelling bacteria, including protection from the immune response, antibiotics and invading species as well as the dispersal of seed bacteria, facilitating colonization of the environment or host at a distant site. How does smoking affect bacteria? Studies in our laboratory identified tobacco smoke, which is comprised of thousands of different chemical components, as an environmental stressor to which oral bacteria respond by altering the expression of multiple genes and proteins, including virulence factors which promote colonization and immune evasion. Since our initial reports that cigarette smoke promotes biofilm formation by the important oral and systemic pathogen, Porphyromonas gingivalis, others have shown that tobacco smoke and components alter the bacterial surface and promote biofilm formation in several important human pathogens, including Staphylococcus aureus, Streptococcus mutans, Klebsiella pneumonia, and Pseudomonas aeruginosa. 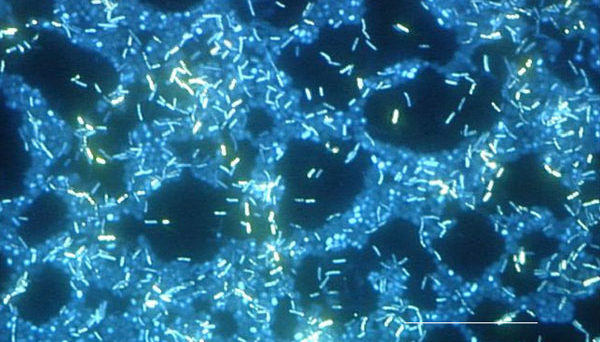 Why are biofilms dangerous to health? Once a pathogen establishes itself within a biofilm, it can be difficult to eradicate as biofilms provide a physical barrier against the host immune response, can be impermeable to antibiotics and act as a reservoir for persistent infection. Furthermore, biofilms allow for the transfer of genetic material among the bacterial community, which facilitates the development of antibiotic resistance and propagation of virulence traits in general. What diseases do biofilms cause? Biofilms are able to form on almost any surface and there are many different biofilm-related diseases. Biofilms are able to form on almost any surface and there are many different biofilm-related diseases. One of the most prevalent biofilms is known as dental plaque. Dental plaque can lead to gingivitis, which is found in almost half the world’s population, and more severe oral diseases such as chronic periodontitis. Bacteria are able to form biofilms on heart valves resulting in heart-related infections. Medical device biofilm-related infections are also common. Other biofilm-related diseases include otitis media, complications of cystic fibrosis, bacterial vaginosis and many others. Does stopping smoking reduce the effects of biofilm? There is little information available on the influence of smoking cessation on biofilms. However, microbial population shifts have been noted on stopping smoking by Dr Purnima Kumar, at Ohio State University. Dr Kumar reported that alteration of the subgingival microflora may represent a mechanism that helps explain the improved periodontal health that is concomitant with smoking cessation. Further, tobacco use exerts profound negative effects on the immune system. Immune recovery on cessation is likely to advantage the host in fighting off infectious diseases. Further research is needed to understand the interactions of the elaborate communities within biofilms and how they are related to disease. Many studies have investigated biofilms using single species, but more relevant multispecies models are emerging. Novel treatments for biofilm-induced diseases are also being investigated. These include the development of anti-microbial surfaces for medical devices; therapeutics that specifically target the adhesive interactions between early colonizers and later colonizing pathogenic species; and small molecule anti-microbials that, unlike antibiotics, can penetrate biofilms. You can read more in another blog from the researchers’ institute here.